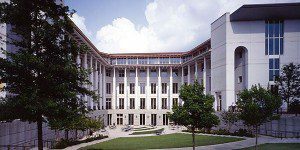 The Emory University Evening MBA at the Goizueta Business School is a part-time program designed to work around students’ busy schedules. The program involves 54 course hours and is usually completed in 24-32 months. The program is also structured according to a cohort model, with students taking core courses with their cohort and electives alongside students from the full-time program. Classes are held twice a week from 6:30 p.m. – 9:15 p.m. The Emory University Evening MBA program is made up of 54 credits, which includes 12 core courses and a choice from over 20 concentration options to focus their studies in. The core curriculum is covered during the first and second years, with courses in the same fields as the full-time program. Students start taking elective courses during the second year and also engage in an International Study Module. These structures are subject to flexibility depending on individual students’ schedules. The typical Emory University Evening MBA class is approximately 70 percent male and 30 percent female, comprising of 90 total students. About 15 percent of students are of minority status, and 20 percent are international. Evening MBA students have an average of six years professional work experience. The average GMAT score earned by Evening MBA students is 640. According to recent data provided by the business school, Goizueta Evening MBA graduates saw a 137 percent salary increase 6-8 years after earning the degree. Emory University Evening MBA students can expect to pay a total tuition of $75,222. With additional fees, the estimated current total comes to $81,376. Financial assistance is available in the form of federal loans and various merit-based scholarships. Interviews are mandatory for all Evening MBA applicants, with flexibility in scheduling available. Applicants must reside and be gainfully employed in the Atlanta area. Applicants must pay a $150 application fee, as well as an additional $25 for each program applied to. All other application requirements are identical to those of the full-time program. All applications submitted after the round four deadline are reviewed on a rolling basis.